Magog was to be my second race of the season. It was also Nationals, with 10 qualifying spots for 2016 Age Group World Championships in Cozumel, Mexico. However, as I've only been running for about 2 weeks post-stress fracture, Mike and I decided that I would again only do the swim and bike legs of the race and sit out the run. While I was at first disappointed and convinced that maybe I could just walk / run, Mike reminded me to keep my eye on the prize. Running a 10k at the end of an Olympic triathlon would have been risky, and knowing my competitive personality, I wouldn't have been able to take it easy. So once again, I handed my chip over after my bike and walked out of the transition zone. It was hard to do, but I think in the end, I will look back and realize that it was worth it! Sharing the weekend in Magog with my dear friends made my less than exciting race a non-issue. I got to share in their excitement and I still got to have a "race" experience. We had a fantastic time. I'm also so proud of all of them for their fantastic efforts and for qualifying for 2016 Worlds! The entire week didn't quite feel like a race week to me, and it wasn't until we arrived in Magog that the nerves appeared. Jenn, Melissa and I drove to Magog on Friday morning, arriving at our lovely AirBnB around 11:30 to drop off our belongings and put the food in the fridge so we could go do our pre-race warm-up. The drive to the race site was about 25 minutes. We parked and walked our bikes over to the beach. Jenn and I were a bit concerned, having heard that the water temperature was only 21C and watching all the other wetsuit clad swimmers, so we took our time getting into the water sans wetsuit (Jenn's was still at home in Ottawa and I was convinced the race would be no wetsuit). The water was freezing, but we did our warm-up swim and a few practice beach starts. I managed to step directly on a large rock and was left with a massive bruise on the bottom of my left foot (thank goodness I wouldn't be running a 10k the next day!). After drying off, we hopped on our bikes to scope out the course. It was significantly less scary than I had remembered it, but I knew that I would need to be cautious on race day. After biking (and shivering the whole way), we decided it was time to eat and picked up some salads from the market next to the race site. Then we made our way back to the house and settled in for some rest while we waited for the others and to start making dinner. We had a lovely family-style dinner with our house (Gilly, Jenn, Dale, Simon, Alex, and Melissa) and OTC friend Kirsten. Lots of laughter and good company helped to ease the pre-race jitters, though we did our fair share of analyzing the competition and talking over the course details. Since our race didn't start until 1:30 pm, we all did our best to sleep in on Saturday morning, though I think by about 7:30 or 8 most of the house was awake. Gilly read Jenn and I an inspiring excerpt from "Born to Run" while we stretched, rolled, and made the first rounds of coffee. I made myself meal number one - a berry and almond butter protein smoothie - and finished prepping my bike for the race. We had the pump up jams rocking and Jenn and I watched "Dreams of Glory" while we ate our next meal (oats, almond butter, nuts, seeds, and berries for me). It is so fun to share pre-race traditions with my friends and to learn about what motivates and inspires them. We had a lovely leisurely morning (strange for race day! ), and finally made it to the race site around noon. It was easy to get set-up in transition and we didn't have to spend too much time roasting in the sun before it was time to race! After bruising my foot on Friday, I told myself to be careful, but to also just go for it at the race start. I had positioned myself with a clear line to the first buoy in the front row. Gilly was right behind me and I also had a nice chat with a girl standing next to me who was wearing our Team Canada kit for Worlds. The rush of adrenaline and nerves was making my stomach turn, so I focused on taking some deep breaths as the announcer told us we had less than a minute to start. With "Take Your Mark," I dug in and readied myself and then the horn sounded and we were into the water. My strategy is to usually start swimming as soon as I can on a beach start, so after a few gingerly leaps over the rocky shore, I dove in and started paddling furiously. There were still girls around me doing dolphin dives and running through the water, but I was happy to be swimming and starting to pull away with the lead girls. I quickly found some feet and attempted to draft off of some girls ahead of me. I have never had a chance to draft in a race, so this was pretty exciting. But, I also realized that there were people drafting off of me too, another first. Instead of worrying about those behind, I just tried to focus on smooth, strong strokes and making sure that I was really getting a feel for the water, as I tried to maintain a quick turnover. The course is fairly well marked with large orange buoys every 50m or so, so sighting wasn't too much of an issue... plus, I had feet and a few yellow caps to follow! I stuck with the same girl until just after the turn back toward the shore, then I did my best to shake her off and chase down the yellow caps ahead of me. Before I knew it, we were approaching the green flags that marked the staircase to exit the water. I ran up the stairs, removing my cap and goggles, and was happy to see Alex, Melissa and Simon cheering right at the top of the stairs! I finished the swim as the 5th overall female (including the wave of over 35 women after us)! The start to my bike leg did not go nearly as smoothly as I had hoped. I had planned to put my feet into my shoes while pedalling, but I couldn't get both feet on to even start pedalling and had to hop off to avoid crashing. Then the shoes were in an awkward position so I had to adjust them *twice* to try again. Once I was on the bike, I realized that despite my best efforts with the body glide and the baby powder, my new shoes, while super cool, were also super stiff, and I struggled to get my feet into them. Finally in the shoes, I began my 40k roller coaster ride. The bike course in Magog is hilly and technical, and at times, downright scary. It was 1000x less scary though than the previous year and I felt much more confident handling the hairpin downhill turns (yikes!). There were moments on the bike when I just had to remind myself to stay focused and have fun. It was not easy. My body didn't seem to be cooperating and my legs just weren't putting out the power that I was hoping for. After the first lap though, I settled in a bit and just ignored my speed and tried to do my best. I took a gel - Gu Roctane Sea Salt Chocolate - about 1/3 of the way through the second lap, and that seemed to help (yay caffeine!). Lap three had a few intense moments, including seeing a cyclist being put on a backboard after having crashed into a ditch on one of the intense technical hill/turn combos. My main goal was to just stay ahead of Dale, Jenn and Gilly. They are all super strong cyclists and I knew that they would be gaining a lot of time on me during this leg of the race. I was right... Dale caught me about half way through the third lap and Jenn and Gilly ran into transition just after me. I also saw Kirsten during the last bit of the third lap and we had a little fun hammering it toward the finish (though her wave started well after ours so she had another lap to go). It was fun and motivating to see friends out on the course! And of course, I reminded myself that I was done after the bike so I might as well spend any energy that I had left and rip it back to the T-Zone! I felt like I got a bit stronger and more confident through the three laps and it was super fun to really open up the legs at the end. After racking my bike and removing my helmet, I flagged down an official to hand over my timing chip. I wish I had known at the time that I needed to start the run to stop my bike time, but alas I didn't know that. Then I went to find our cheering squad to help cheer Colin, Gilly, Jenn and Dale to the finish. It was so fun to encourage them and be that embarrassing friend screaming their names. They all finished strong and had great races! I'm so proud of everyone. 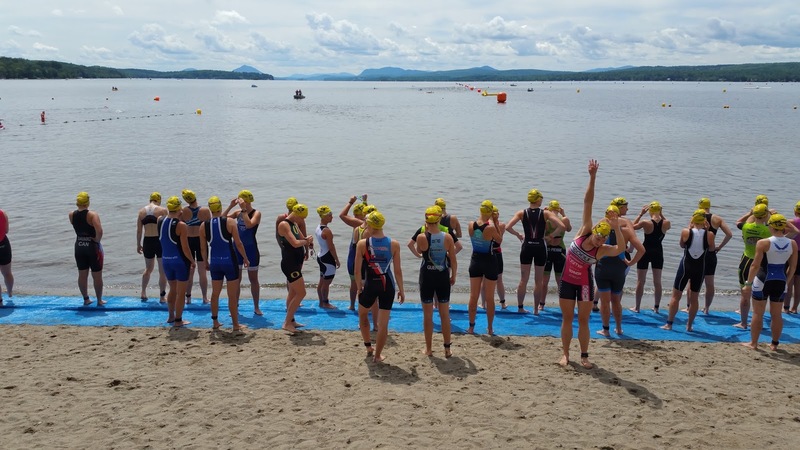 I'm keeping my fingers crossed that Magog was my last swim-bike only race of the summer. I have two more races coming up - Cornwall and Worlds - and you better believe that I will be running! The mental and emotional challenge of recovery has been my biggest foe this summer. It has been a roller coaster at times and recovery has been almost more challenging than being injured. But, I've learned so much and I have had so much fun thanks to the amazing people in my life - my triathlon family, coaches, regular family, and friends. Every time I race I am reminded of why I love this sport, and I was thankful to be healthy enough to at least swim and bike at Magog. A big thank you to Mike for reining me in when I ask to do silly things like race only 2 weeks back to running and for always having the right thing to say when I need it most. Thank you to Coeur Sports for the most beautiful, comfortable kit out there. Thank you to Osmo Nutrition for keeping me well hydrated on a hot race day where many of my fellow competitors ended up in the med tent (one bottle of Osmo Active Hydration for Women in the morning and one on the bike). Thank you to our photographers and cheering squad. Thank you Gilly, Jenn, Dale, and Colin for always inspiring me to be a better athlete and for being such amazing friends. Thank you Dave for reminding me to keep calm and carry on, especially on the bike, and to remember that the people are the best part of triathlon.